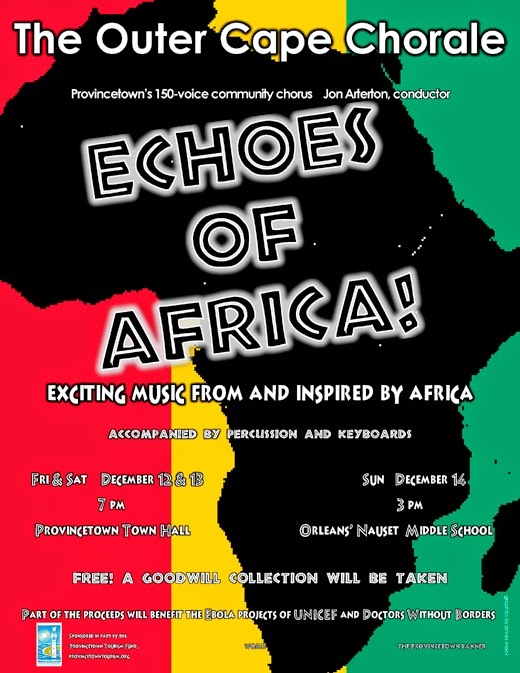 The Outer Cape Chorale's 2014 holiday season concert features music from and inspired by Africa. The Outer Cape Chorale, conducted by Jon Arterton, will perform what I can safely say will be an exciting, amazing holiday concert in Provincetown and Orleans, December 12th through 14th, because this stellar 150 voice choir has never given a performance that wasn't both exciting and amazing! They've tackled musical genres ranging from classical to Broadway, from sacred to singer/songwriter, from Gilbert & Sullivan to the Beatles, and have delighted us at every turn. Starting out basically as a small choir of friends in 2002, the group has grown to roughly 150 members who travel from all over Cape Cod to sing together and perform to packed houses who eagerly look forward to the Chorale's concerts, performed a few times each year, and tackling a different sort of music with each set of concerts. will be featured at 7 PM on Friday, December 12th and Saturday, December 13th at Provincetown Town Hall, and at 3 PM on Sunday, December 14th at Nauset Middle School in Orleans. Outer Cape Chorale performing at Provincetown Town Hall. Photo by John Gullett, from OCC website. One of the most remarkable things about these concerts is that each performance is free of charge. To make their music available to absolutely anyone who would like to hear it, the Chorale charges no admission fee, and everyone is welcome to attend. A good will donation will be taken, and part of the proceeds will benefit the Ebola projects of UNICEF and Doctors Without Borders. Make plans to attend at least one of these three performances, guaranteed to fill your heart and feed your soul.